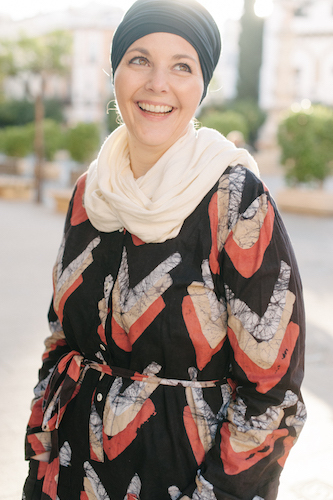 I am rarely found in clubs or bars so I asked Brenda to share her tips for where to go out in Marrakech. If you’re after clubs, bars or other popular spots for dancing and drinking – she’s sharing her favorites! 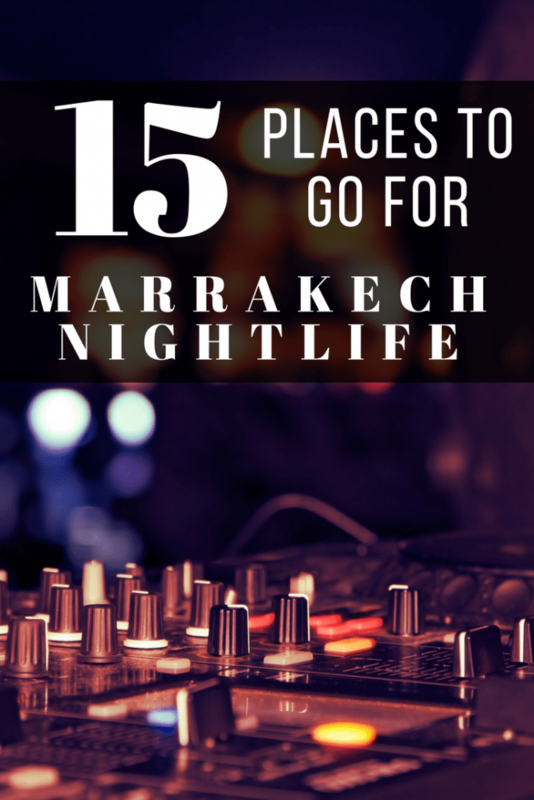 If you’re looking for budget Marrakech nightlife options, you likely won’t find them, especially where alcohol is involved. Morocco isn’t a dry country and there is a heavy duty on alcohol, something to keep in mind as you compare costs. One of my favorite things about Marrakech is its nightlife. While I can get down with hanging out in Djemma El Fna at night from time to time with friends to eat in one of the food stalls or listen to the Gnawa musicians or watch some of the traditional games being played, sometimes I just want to get dressed up and check out a restaurant, bar, or a good ol’ nightclub. This is actually my favorite restaurant and rooftop lounge in the Djemma El Fna area. The food menu is all Moroccan and though my favorite Moroccan food is made in homes, this place ranks pretty high in my book. Meals range from 150-350 dirhams. The ambiance has a romantic blend of traditional Moroccan riad décor and the look and feel of a jazz bar. On the rooftop you can enjoy hookah and cocktails with their daily “Happy Hour” (which is more like regular prices since the special lasts all night) two for the price of one cocktails. So if you like mixed drinks then you can enjoy 2 strawberry mojitos for 150 dirhams while listening to their local DJ’s music mix and their belly dancer performances. This beautiful riad is located in Arset La Maach near the Mellah plaza. It’s a great location for a romantic nightcap or day drinking on their rooftop level. The staff is very friendly and if the owner is around he will pass by checking on his guests to make sure they feel attended to and are enjoying the space. Kosy Bar is on the other side of the Mellah Plaza. 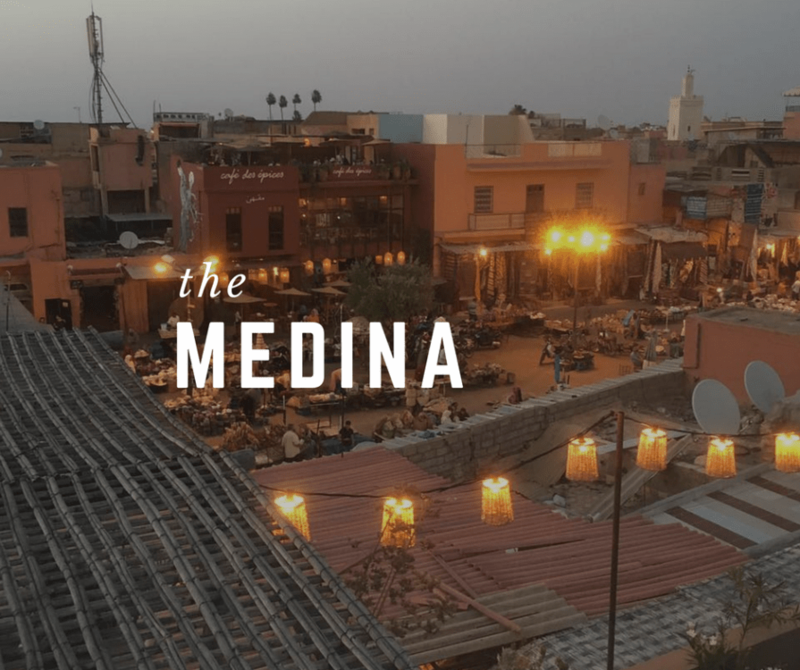 It has a great rooftop patio that gives you a fantastic view of the Medina at sunset. It’s a bit pricier than other locations in the area but it’s still a great location for dinner and a bottle of wine. A few doors down from Kosy Bar you can check out Le Tanjia. Beautiful décor and a great rooftop patio another location you enjoy dinner and fantastic views. This is the Kasbah’s gem of restaurants. It plays a modern twist on traditional Moroccan cuisine like their famous camel burger. While they don’t serve alcohol here that doesn’t stop the place from having a great night scene. They regularly have Gnawa musicians performing and most people even up on their feet dancing and clapping by the end of it. Also they offer traditional Moroccan storytelling in English for visitors to learn more about local culture. Its young, fun, and a total Moroccan hipster’s place to chill. 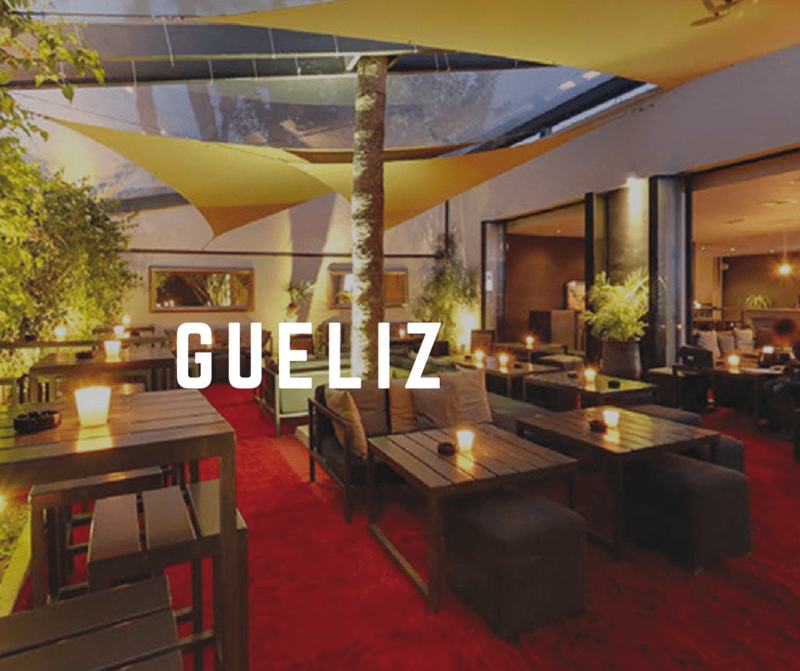 Now let’s move to the new city, Gueliz, where you can forget you’re in Morocco and feel like you’re in Europe instead. This part of town definitely has a larger variety of bar, clubs, and lounges so if you’re a traveler that prefers to city lights and club hopping this part of town is for you. This is my go to spot in Gueliz. It’s the ideal place to start or end your night. It’s a restaurant, bar, and library/bookstore all in one. You can enjoy American comfort foods like buffalo wings and burgers like their Rock n’ Roll burger with draft beers starting at 25 dirham. On Mondays, you can participate in their trivia quiz night which brings in a large international crowd. During the week, they offer happy hour drink specials and on Friday & Saturdays they have live music performances. If you’re a sports fan, they also stream major sporting events. If you want to have some sub-Saharan African flavors you need to come here. The décor is funky and the food is great if you want try something besides local cuisine. The scene is young with local musicians making it one of their favorite hang outs. This place is pretty new in Marrakech but between its well-priced drinks and tapas to the modern art you can purchase off the walls, it’s becoming a fast staple in the nightlife scene. This lounge has a very French-Moroccan style and is a great location to share some drinks and tapas with friends. Another new location that just opened but also becoming quite popular is Barometre. The location has a dark, smoky feel but the design is modern. The cocktails are on the pricey side but they are generous in their drink sizes. Also, you have to try their burgers! If the club is less your thing and you’re simply looking for a nice place to have a drink with friends over some good wine this is the place. Wine is by the glass and there is also food available. Smoking is allowed so this might be something you want to be aware of if you’re sensitive to smoke. I saved the most expensive hotel clubs and a casino for last. 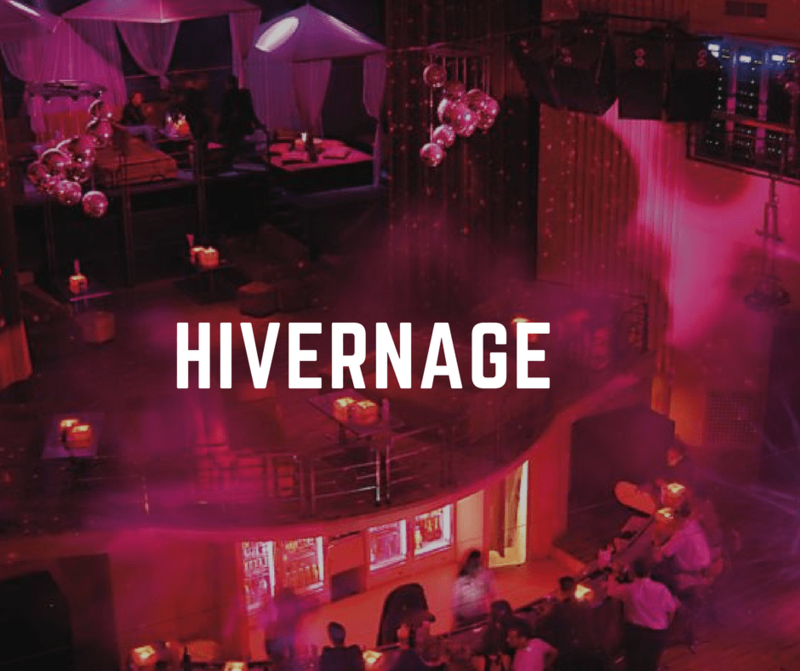 The very posh neighborhood of Hivernage features some of the most glamorous and elegant hotels in the city. Theatro is a fantastic nightclub that has amazing performances with dancers, acrobats, and more every weekend. 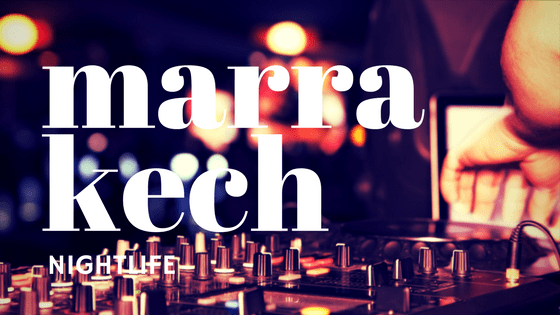 I’ve been there to see international and local DJs spin while Gnawa musicians come out on stage to create a crazy remix with their drums. But there is a price tag. Standard entrance is about 225 dirhams and a table with a bottle of your choice starts at 1000 dirham. These two I’m going to put together as they are both in the same building next to Theatro which are all part of the Es Saadi Hotel grounds. If you like slots machines and gambling then you can check out the Casino and test your luck. If you prefer to skip the gambling, you can walk straight to the back and find this restaurant-by-day-nightclub-by-night. They have two in-house DJs and a live band that covers old and new hits in their own style. La Perle is a lovely rooftop bar with views of La Mamounia hotel. They have a live band that plays salsa music accompanied by dancers so if you want to get some Latin flavor in the city, this is the spot to check out. The SO Lounge is a part of the Sofitel hotel. They have food service as well as regularly scheduled live music – singers and bands. It is on the expensive end so if you’re on a budget perhaps opt for dinner elsewhere and come to party later. A final bit of advice. Many riads don’t offer alcohol but you are welcome to bring your own. You can always pop into a grocery store (like Carrefor) and purchase a bottle of whatever you’d like and enjoy on your riad rooftop. Chances are if they do serve alcohol they won’t be too open to you bringing in drinks. Not sure? Just ask! Hi. I am heading to Morocco for 2 weeks in July. I am more interested in places to see live music/ concerts. No necessarily traditional or classic music but local or international urban/ pop artists. I am not looking to go to a bar as I don’t drink. Not looking to dance either. So more Madison Square Gardens or smaller lounges vs night club vibe. I’m afraid I don’t have a lot of advice on this as it’s not something that I do a lot of. I’m sorry! Thank you for the recommendations! We went to Le Salama and had great food/service both times!